Today’s crisis-hit Karachi was once considered a peaceful and clean city in the British India, it was upgraded to a city by the British government therefore we see the city’s old architecture having a striking resemble’s to some European cities. Britishers came to Karachi on February 3, 1893. Englishmen wanted to make Karachi into a mega sea port city. Karachi port became the largest exporter of wheat in the East. People in search of jobs came from China, Arab states, UK etc. 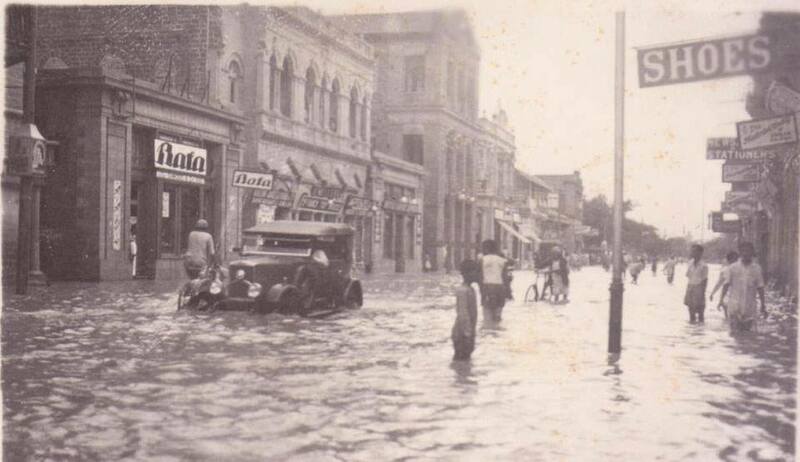 The above picture is taken in 1944 but the year and the date is not known neither the location but it can be said that the picture was taken during the monsoon season. According to the data collected from Indian Meteorological Department (IMD), on 27 July 1944, a cyclone left some 10,000 people homeless in Karachi, the picture might not be related to the cyclone. However a news article from Pakistan’s Dawn Newspaper shows that very heavy downpour occurred on August 2, 1944 as 162.4 mm rain was recorded which is the highest rainfall for August. ← Pakistan under floodwater again – Guinness World Record?